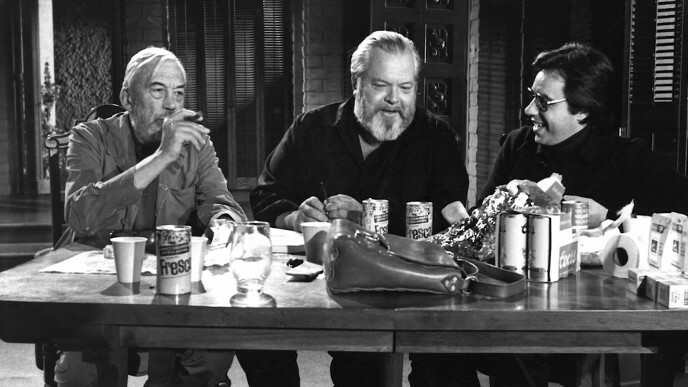 John Huston, Orson Welles, Peter Bogdanovich during production of The Other Side of the Wind. But with Veil Now Lifted, Will People Still Care? THE BEST WAY to make people want to watch a movie is to forbid them from seeing it. 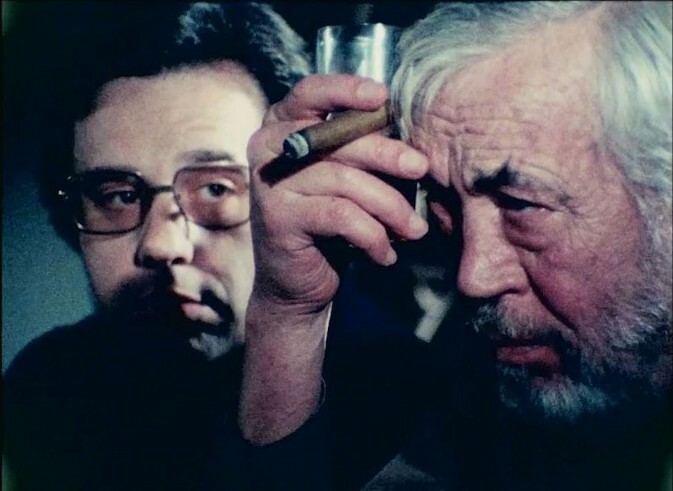 The Other Side of the Wind—which Orson Welles shot dozens of hours of footage for in the 1970s but never finished, and which remained unreleased for more than 40 years because of disputes over ownership rights—has finally been completed and released, 33 years after Welles’s death in 1985. The movie, Welles’s last, is being screened in theaters and shown on Netflix, the studio that finally succeeded where no one else had, by untangling the legal mess and bringing the movie out of obscurity and into the flickering light. A blur of life imitating art and art imitating life, The Other Side of the Wind is about itself: a legendary but aging director has returned to Hollywood after a decade of exile in Europe and is trying to make his comeback film, but can’t finish it for lack of financing in an industry swept by changing public tastes. John Huston, a venerable director in real life, plays the alcoholic director Jake Hannaford, an amalgam of himself, Welles and Ernest Hemingway. Not so much a story as a whirling—and often dizzying—kaleidoscope of images and dialogue fragments cut and spun together from multiple cameras and viewpoints, some in color, others in black-and-white, the movie centers around a 70th birthday party for Hannaford, at which he attempts to screen a cut of his would-be comeback film, also called The Other Side of the Wind. The guests are an extended entourage of friends, crew members, studio flunkies, movie critics, biographers, sycophants and hangers-on. Peter Bogdanovich, then the hot young director of The Last Picture Show and Paper Moon and still years away from his own fall from the heights of Hollywood, plays Hannaford’s protégé turned nemesis, the successful young director Brooks Otterlake. The movie within the movie, the one that Hannaford screens at the party on the last night of his life, is supposed to be an example of his character’s artful filmmaking. For Welles, it parodied what he saw as the slow, boring, pointless European movies being made by directors such as Michelangelo Antonioni. Welles’s movie switches back and forth between the party at Hannaford’s ranch in the desert—where the electrical power goes out, making the screening of the incomplete movie incomplete—and Hannaford’s film, which contains some stunning shots but is mostly pretentious and empty. Oja Kodar, Welles’s real-life mistress, stars in Hannaford’s movie but has no speaking parts. Her job is to be naked and beautiful, and she obliges. The Other Side of the Wind mirrored what was happening in Welles’s career at the time while also reflecting the chaotic nature of its own production and foretelling its future legacy. Like Hannaford, Welles himself would die at 70, never having completed his final cinematic statement or revived his once-brilliant career. Welles spent six years filming The Other Side of The Wind on and off, as financing would dry up and then trickle forth again. As author Josh Karp writes in his definitive book Orson Welles’s Last Movie: The Making of The Other Side of the Wind, it was “a film that could never be finished. Because to finish it might have meant the end of Orson’s own artistic story—and that was impossible to accept. So he kept it going and going.” And because The Other Side of the Wind remained unfinished and unreleased for so long, its mystique only grew. It’s reassuring to know that stories can come back to life decades after being declared dead, that a person’s hard work and dreams, even after appearing to have been defeated by external forces, can finally emerge into the world. But in the end, the legend of Orson Welles’s lost masterpiece may have been more interesting than the movie itself. Despite its flashes of genius, Welles’s final film becomes as tedious and pointless as Hannaford’s—which, after all, is what we’re seeing for about half the running time. The other half is a vortex of close-ups of the partygoers’ faces and scraps of dialogue. After establishing himself as a wunderkind in theater and radio, Orson Welles made his name as a film director in 1941 with his landmark first movie Citizen Kane—which like his other films such as The Magnificent Ambersons, The Lady from Shanghai and Touch of Evil, combined compelling stories with extraordinary visuals. The bookend to his moviemaking career, The Other Side of the Wind is mostly style and very little story, making it a chore to watch. After a while you just want to escape it. When a movie is renowned because few people have been allowed to see it, intriguing audiences with the lure of the unobtainable, its mystery vanishes when it’s shown to the public. The fact that Orson Welles’s final movie has at long last been extricated from the legal and financial entanglements that held it hostage and out of view for more than 40 years will have film nerds lining up for screenings and tuning in to Netflix to watch it. But then The Other Side of the Wind becomes what it likely would have been four decades ago had it been completed and released on a more traditional schedule: an art-house curiosity or midnight movie that soon fades into obscurity. Karp co-produced a documentary about Welles’s last film. Called They’ll Love Me When I’m Dead, the documentary is also airing on Netflix.